Challenges for the Environmental Crimes Law in Pará. Brito, B. & Barreto, P. 2005. 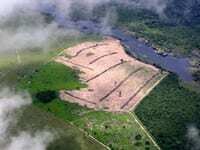 The application of the Environmental Crimes Law has not been effective for the protection of the Amazonian forests. The reasons include the lack of integration between the institutions responsible for punishments and the application of penalties unrelated to environmental damage, weakening the fight against the illegal logging of forests and disfavoring the repair of environmental damage. To reverse this situation the authors recommend: integrate the actions of the authorities involved in applying the law and invest part of the fines in environmental funds for the repair of damages and in inspection and control.